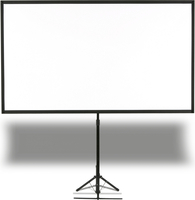 - The EGA series screens offer a simple yet elegant design, with functionality the highest priority. 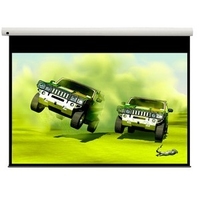 - EGA screens utilize a single aluminium alloy construction, greatly increasing structural integrity making the screen sturdier and providing smoother operation. - Innovative and simple installation makes these screens suitable for most types of environments. 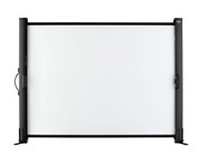 EGA screens utilise a single aluminium alloy construction, greatly increasing structural integrity which in turn makes the screen sturdier and provides smoother operation. Innovative and simple installation makes these screens suitable for most environments. The EGA's tubular motor ensures smooth, stable operation, and years of reliable and trouble-free use. The tubular motor operates quietly, with a noise level below 45dB. The Optoma integrated control system includes an in-line switch, built-in remote control system, 12v trigger, RS232 and external infrared receiver. 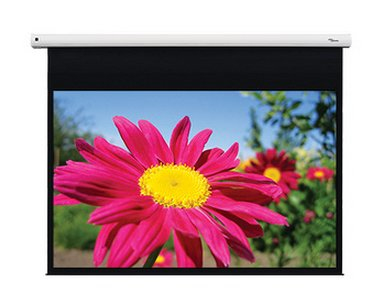 This all-in-one integrated system guarantees a screen that is suitable for the most demanding applications. With a tubular motor at the heart of your motorised EGA screen, and built-in I/R, you're ready to to hang and use your screen in minutes. The floating L-bracket design allows horizontal adjustments and therefore can be fixed at any preferred point on the screen casing.